Statement Regarding Charisse Carney-Nunes and Recent Events Surrounding Bernice Young Elementary School. Charisse Carney-Nunes was invited to Bernice Young Elementary School by the Burlington Township School District because of her status as an award-winning children’s book author. Charisse presented all of her books, including her recent book I Am Barack Obama, a book capturing the example of President Obama to highlight children’s personal power to change the world. Charisse did not write, create, teach or lead the song about President Obama in the video. The song was presented to her by a teacher and students as a demonstration of a project that the children had previously put together. Charisse feels it is unfortunate that an event put together with sincere intentions to encourage literacy while celebrating the contributions of African Americans to our great nation has been become political fodder, and hopes cooler heads will prevail. See Media Clips on Charisse and Recent Events Surrounding Bernice Young Elementary School. This past March, Charisse Carney-Nunes, author of three children's books including I am Barack Obama, was invited to speak at a school in Burlington, New Jersey where she discussed the inspiration of writing, literacy and American democracy to a group of children. Unfortunately, the events of that day --as sincere and inspired as they were-- have been taken out of context and used as political fodder. 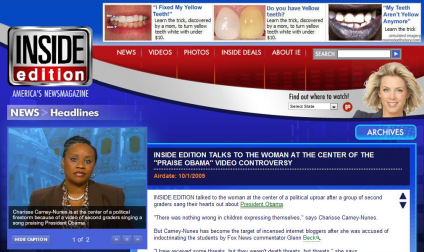 In case you missed the Inside Edition Exclusive featuring Charisse Carney-Nunes talking about the growing national controversy surrounding her appearance at a school event in Burlington, NJ. Below is the Inside Edition video that explains exactly what happened. "WATCH the Inside Edition EXCLUSIVE below!"